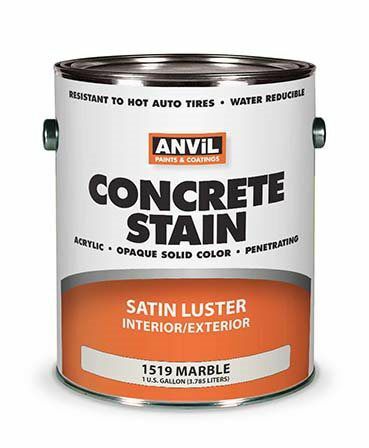 One of Anvil's most durable product line includes concrete stains, single part epoxy coatings and sealers for horizontal and vertical surfaces. They incorporate modern coatings technology, making them easy to apply as well as extremely durable. The new line includes enhanced bonding primers, solid color and semi-transparent stains and sealers that provide countless decorative options in addition to increased protection from weather, chemicals and routine wear. New technology for wood decks and concrete. Rejuvenates wood with an eco-friendly textured coating. Deck-A-New has 100% acrylic durability - is barefoot friendly, locks down splinters, repels water - fills cracks up to 1/4 inch. Crack and peel resistant. -Can also so be used on masonry walls, concrete tile roofs and pool decks. -Resists damage from many types of household chemicals, motor oil, transmission fluid, gasoline and more. -Water based, no noticeable fumes or odors and you have the convenience of easy cleanup with soap and water. -We recommend that it be used on smooth concrete. -Combines the durability of epoxy coatings with the ease of water cleanup in a single component coating. - Highly resistant to the effects of hot automobile tires and delivers a solid color satin finish and can be top coated with Anvil 2350 ‘Wet Look¹ Sealer to add a gloss finish to the surface. 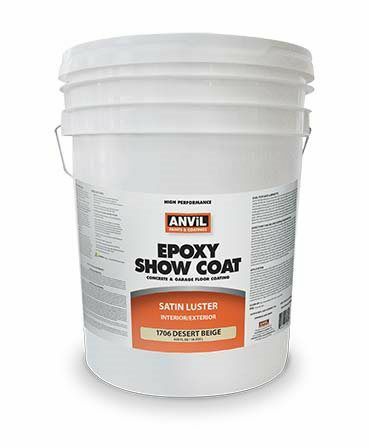 -Formulated for use on interior and exterior painted or unpainted concrete surfaces such as garage floors, driveways, patios, walkways, decks, basements, shop floors, pool decks and sidewalks. -Highly resistant to automotive chemicals, oil, grease and gasoline. -Its’ durable acrylic/epoxy formula also resists fading, scuffing, cracking, peeling and blistering. 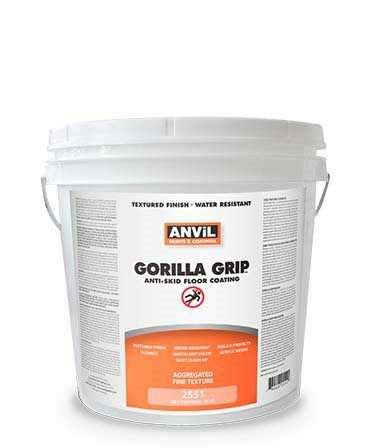 -We recommend that Anvil GripTite Bonding Primer 1750 be used on smooth concrete. 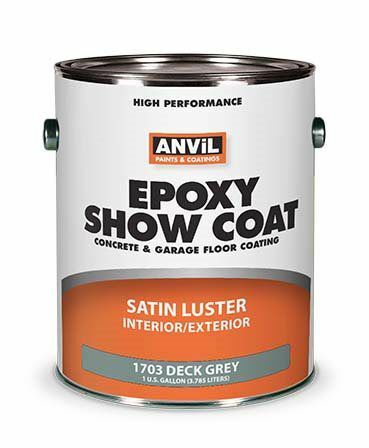 -Combines the durabilty of epoxy coatings with the east of water cleanup in a single component coating. -Highly resistant to the effects of hot automobile tires and delivers a solid color satin finish and can be top coated with Anvil 2350 Wet Look Sealer for a gloss finish. 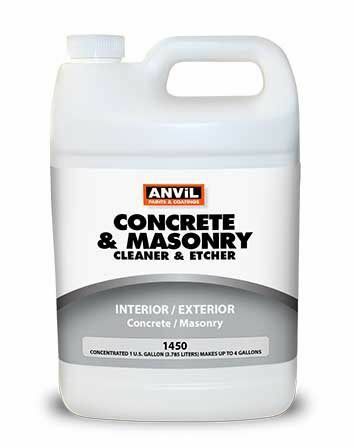 -Formulated for use on interior and exterior or unpainted concrete surfaces such as garage floors, driveways, patios, walkways, decks, basements, shop floors, pool decks and sidewalks. -Durable acrylic/epoxty formula also resists fading, scuffing, cracking, peeling, and blistering. 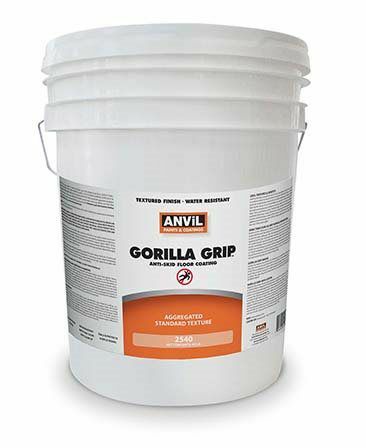 -We recomment that Anvil Grip Tite Bonding Primer 1750 be used on a smooth concrete surface. 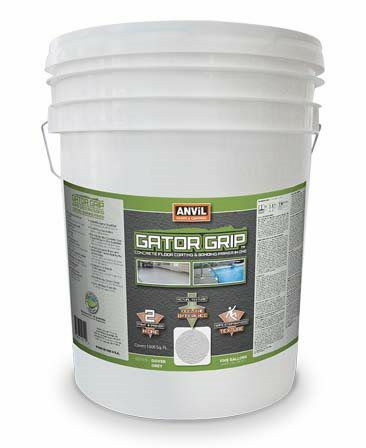 Anvil GatorGrip is a waterborne acrylic, non-slip, textured coating that provides a decorative light texture on surfaces’s of concrete and masonry where increased traction is required. GatorGrip is tintable and/or paintable to perfectly match most custom color systems and provides a decorative light texture finish. It is non-flammable, low odor and is environmentally safe. Can be used as a decorative and protective coating on concrete, asphalt, wood stairs, floors, pool decks, patios, loading docks, sidewalks, residential garages, carports, residential driveways, ramps, balconies etc. GatorGrip will help prevent weather deterioration of concrete while providing a unique light surface texture. Decorative color choices are limitless. Helps hide surface imperfections. Resists damage from moisture, salt, chlorine, gasoline, and oil. Easy clean up with soap and water. -Beautify and protect concrete surfaces. -Transform ‘ordinary’ looking concrete into a work of art. -Formulated for use on unpainted concrete surfaces such as drive ways, garage floors, patios, walkways, decks, and sidewalks. For application and usage, click on the SDS.